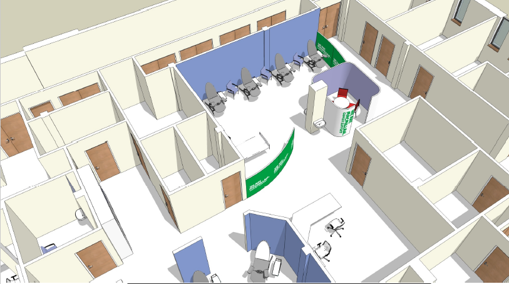 The refurbishment of Ward F11 – Haematology Unit consists of the re-location of the the reception desk and entrance door to provide more space. The reception and select rooms within the ward will receive a full refurbishment of flooring, ceiling and floor finishes. The refurbishment has been specifically designed to incorporate the level of traffic the ward receives, while creating a fresh, vibrant surrounding. Fellows were appointed to provide early cost advice and an order of cost relating to a range of proposed design options, and were able to use their expertise to advise on the most cost effective solutions that would provide the greatest value to the ward. Due to an exceptional service, Fellows were then appointed for the Business Case and final delivery of the preparation of tender documentation and evaluation of tenders. Fellows are working closely with both the Client and the design team to ensure the procurement process is as efficient as possible.